Google any male style icon and you're all but guaranteed to find a photo of him in a leather jacket sometime. Perhaps because they're so durable. Or able to be easily dressed up or down. Or simply make anyone look cool. They're a smart buy, but they're not cheap. 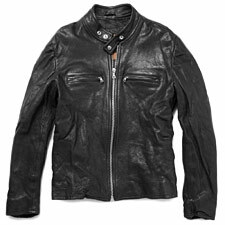 Buying a quality leather jacket (this is no place to skimp, it really shows) can be intimidating. The key is finding the right style for you and then the right price. Thankfully, stores are currently putting them on sale. And, of course, there's always eBay. Unlike those of previous generations, today's are slimmer, softer and worn-in. Herewith, four classic versions that will always be in style. Born on the backs of WWII pilots, this rugged jacket has slimmed down since then, but retained the greased leather, roomy front pockets and ribbed cuffs and waist. 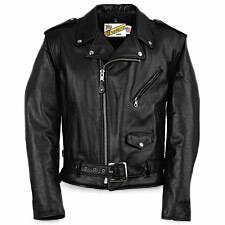 The asymmetrical Schott Perfecto, first sold in 1928, is the mother of all motorcycle jackets, to which all others aspire. They're hard-wearing and tough, just like their owners. Also known as the motorcross or modern biker jacket, this band-collared style has a clean, modern silhouette. Just stay clear of racing stripes and any patches or built-in pads. Often characterized by four front pockets, these have military design touches like shoulder epaulets and bellows pockets. Longer than the others, they sometimes fall just past the waist. A leather jacket is your second skin—literally. 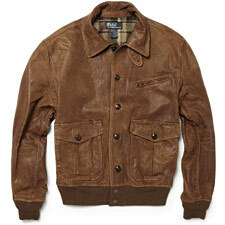 It should fit like a well-worn denim jacket: snug, yet comfortable. 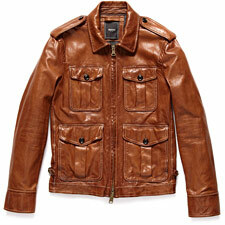 The better leather jackets today have high armholes, eliminating the excess fabric.